There is no denying that the contact lens world is all about daily disposable lenses, and with CooperVision's recent acquisition of Sauflon, they added a new option to their growing line of single wear lenses. The Clariti 1 Day lens is a silicone hydrogel single use lens that is available in spherical, astigmatism, and multifocal options. This marks the first "family" of silicone hydrogel daily use lenses to be available from any company. You know the advantages of silicone hydrogel (SiHy) contact lenses for ocular health. Now your hydrogel-wearing patients can know them, too. CooperVision clariti® 1 day lenses make upgrading your patients to SiHy easy. Because SiHy lens material allows more oxygen to pass through to the cornea than hydrogel, your patients will appreciate the benefits of whiter eyes and a healthier** lens-wearing experience. The clariti 1 day lens allows 100% corneal oxygen consumption***. In fact, it provides more than the recommended amount of oxygen**** across the entire lens surface to help maintain ocular health. CooperVision clariti 1 day features WetLoc® technology, a process that creates a hydrophilic lens with optimal wettability. WetLoc® is a non-surface treatment technology that manipulates the structure of hydrophobic silicone molecules so they become hydrophilic. This creates a lens that naturally attracts and binds water molecules, holding them tightly to the lens surface. WetLoc® also provides continuous wettability throughout the wearing time. The result is a lens with high water content that provides excellent all-day comfort for your patients. Talk to your patients about the healthy advantages and daily convenience of clariti 1 day contact lenses—an excellent choice for new patients and an easy upgrade for your current hydrogel lens wearers. We know silicone hydrogel lenses offer superior oxygen levels to the corneal surface, but the hydrophobic (water repelling) silicone in the lenses can lead to end of day comfort and wetting issues. The solution is Clariti's "AquaGen" technology that alters the silicone polymers into becoming hydrophilic. This allows the tear film to better adhere to the surface of the lens and retain that natural moisture as the day progresses. 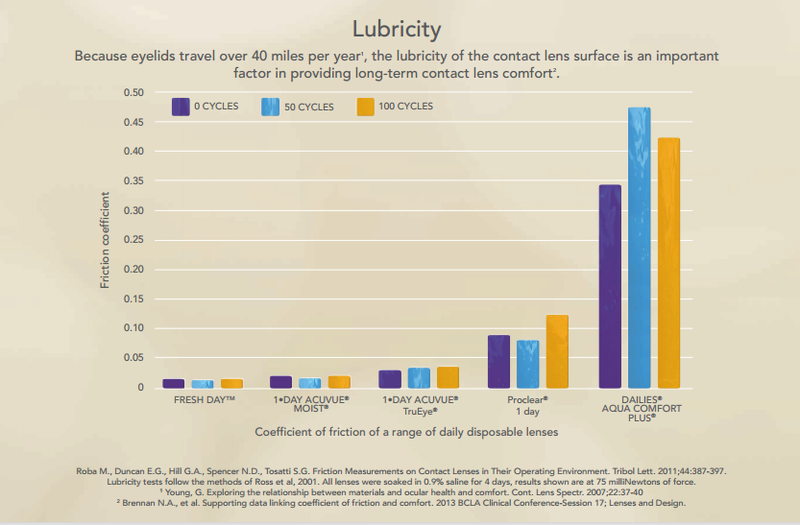 Other comfort perks include a a lower modulus lens material (a softer, more flexible feel to the lens) and higher water content than any other silicone hydrogel daily disposable lens on the market today (Dailies Total 1 and Acuvue TruEye). The lens also boasts Class II UV blocking for added sun protection (98% of UVA and UVB rays blocked). Take Home: A great lens for the price! If you are experiencing dryness, redness, or comfort issues this lens is worth exploring. be sure to check your Bulk, Trash, Junk and Spam folders.